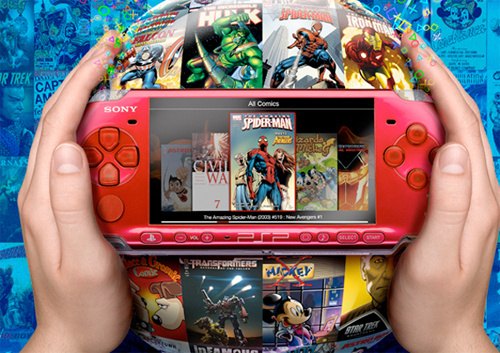 PSP Comics have released their latest comics available online! From DC Comics we have issue 3 of Frank Millerâ€™s Batman: Year One, and more of the amazing DMZ series. We also have two special one-shot crossover issues from the disturbed mind of Warren Ellis â€“ Planetary/Authority: Ruling the World, where Ellis almost brings the two teams together to fight a giant octopus-like monster; and Planetary/JLA: Terra Occulta in which DC and Wildstorm universes clash in an alternate reality. Finally, DC are offering another free comic from their Zuda imprint. The Night Owls #1 is a light hearted strip set in 1920â€™s New York following a group of detectives who solve supernatural crimes. Marvel bring us another splash of brains with the start of the five issue Marvel Zombies 2, plus we see more Black Panther and Astonishing Tales. IDW release Ghostbusters this week in which the boys visit a comic book convention. You can see a preview of the book here. Transformers and Star Trek fans will also be happy. Disney/Pixar take us under the sea to follow a little fish called Nemo. If youâ€™ve got kids, you must buy them Finding Nemo. Last, but not least, we see the conclusion to Cancertown.